On 24 November 2016, the German edition of a book by His Holiness Patriarch Kirill of Moscow and All Russia, entitled ‘Freedom and Responsibility: A Search for Harmony – Human Rights and Personal Dignity,’ was presented at the Russian Centre for Science and Culture in Berlin, marking the 70thbirthday of the Primate of the Russian Orthodox Church. Presenting the book was Bishop Antony of Bogorodsk, head of the Moscow Patriarchate’s Administration for Institutions Abroad. As Bishop Antony noted in his speech, the book focuses on the correlation between man’s freedom and his responsibility before God, society and himself. This responsibility is of exclusively moral nature and implies the personal choice. Bishop Antony emphasized that according to the author, it is on the religious tradition that man is to base his ideas of immense value of human life. 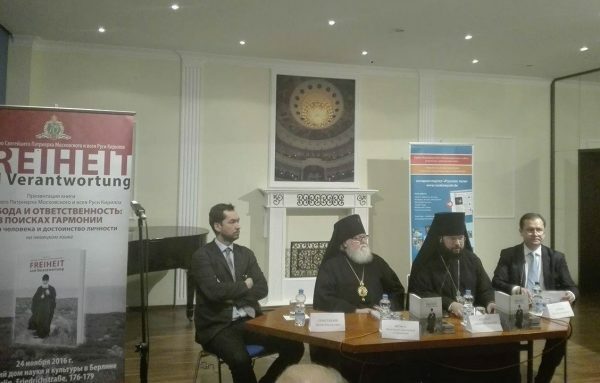 Among those who spoke at the presentation were also Archbishop Feofan of Berlin and Germany; Mr. Leonid Sevastyanov, executive director of St Gregory the Theologian Charity Foundation; Mr. Igor Lapshin, deputy director of St Gregory the Theologian Charity Foundation; as well as Duke Christoph of Oldenburg, chairman of the German-Russian Young Leaders Conference. The presentation was attended by the participants in the round table discussion on the Russian Orthodox Church and Compatriots: Experience of Cooperation in Europe, as well as by representatives of Russia’s Embassy in Germany, the Russian Centre for Science and Culture, and the Russian and German mass media. A photo exhibition on the Mission of the Russian Orthodox Church in Today’s World opened at the hall where the presentation took place. It was organized by the Publishing House of the Moscow Patriarchate, St Gregory the Theologian Charity Foundation and the Russian World Foundation.